I must say... what a pity that these two beauties are not available in Singapore! I have been missing them for so long, and finally I managed to put my hands on them on a trip to New York. Pancetta and guanciale are two fundamental ingredients for Italian cooking. There are a number of sauces and dishes that cannot be accomplished without these beautiful pieces of meat. Pancetta (the round one in this picture), as the name suggests, is cured pork belly. It can be eaten as a cold cut with bread, but mostly it is used for cooking, diced in small or larger pieces. Guanciale (the left one in the picture) is cured pork cheek. It is even fatter than pancetta, and used to start off wonderful sauces such as Amatriciana, Carbonara or Bolognese. 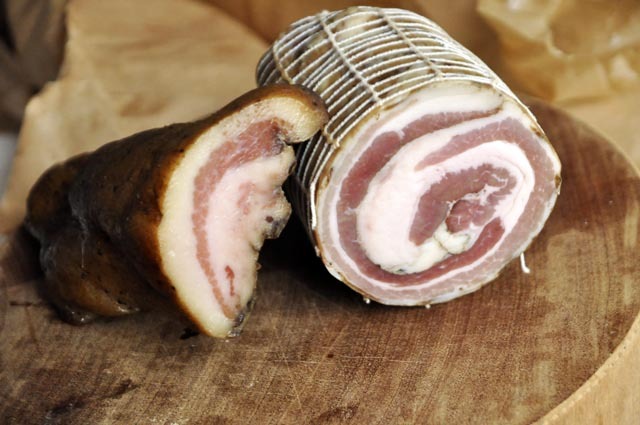 Sometimes pancetta is used in place of guanciale to cook these dishes due to availability, however guanciale is even tastier than pancetta and has a different type of fat. Harder when raw, and once cooked you will notice that the fat of guanciale becomes transparent, while the pancetta fat remains white and solid. I've purchased pancettea previously from Tanglin Marketplace and also some of the specialist butchers that have sprouted everywhere. That's interesting. I suppose it must be from wither Australia or France, since Italian pancetta cannot be imported. Do you remember which butcher you bought it from? I would be happy to try it! There is always a possibility that they import illegally :) so it might be from Italy. Go to the meats counter (not the hams counter). sorry to bug you again but is it easier to get it in london? if so, whereabouts?